On March 31st, government officials joined Chinatown Partnership Local Development Corporation (CPLDC) executives in kicking off a long-term program to improve sanitation in New York's Chinatown. The first phase involves the placing of 50 state-of-the-art trash cans throughout the streets of Chinatown. 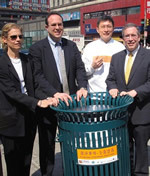 Manhattan Borough President Scott Stringer joined CPLDC Executive Director Wellington Chen, along with officials from the Lower Manhattan Development Corporation and the September 11th Fund, as the first trash can was unveiled at the Chinatown Visitor's Information Kiosk. The initiative is the first undertaking in a four-year "Clean Streets" initiative, which aims to improve the physical environment of Chinatown by making it dramatically cleaner, safer and more attractive for residents and visitors. "Clean Streets" was conceived in response to surveys of both Chinatown residents and visitors identifying sanitation as one of the top concerns in the neighborhood. Other initiatives will be launched later this spring. "As one of America's truly unique communities, Chinatown and its future depend on the efforts of all its residents and businesses, as well as the support of New York City to remain vigilant and committed to improving the quality of life here," said Mr. Chen. At approximately three-and-a-half feet, the new trash containers are almost 50% taller and a good deal heavier than New York City's other 25,000 cans. Each container has two plaques, with "A cleaner Chinatown starts here" written in English and "A cleaner Chinatown depends on you and me" in Chinese. The containers are funded by Chinatown businesses, community groups and city agencies. Initial funders include World Journal Newspapers, Sweet-N-Tart restaurant, and the Chinese American Real Estate Association. CPLDC administers the Clean Streets program in partnership with the New York City Department of Small Business Services and support from the Lower Manhattan Development Corporation, The September 11th Fund, the Council for a Cleaner Chinatown and the New York City Department of Sanitation.